Have you ever been tempted to chicken out on a goal that proved harder to achieve than you expected? I can’t count the number of times I’ve taken on a new project, only to drop it because it takes longer than I thought. Luckily, I don’t have to go far to find a hero who inspires me in the perseverance department. He sleeps next to me every night! When we moved to Turkey 14 years ago, my husband dreamed of being able to preach in Turkish. He loved studying and sharing God’s word. However, after a year of full-time language study and several years working with a private tutor, Jose still struggled to participate in simple conversations. One day his dream hit rock bottom. The man didn’t mean to be unkind, but we were crushed. Amazingly, Jose didn’t give up. He continued to devote an hour each day to language study. He labored to read the Turkish newspaper. He studied grammar and watched television programs. Day in and day out, he made small improvements. Most importantly, he continued to enjoy people. Even when he could hardly talk, people loved my husband for his warm smile and gentle manner. Years passed. Today Jose is a proficient Turkish speaker. He can preach. He doesn’t speak perfectly, but he communicates God’s Word with passion. It’s a miracle of grace and a lesson in perseverance. Perseverance isn’t a popular word in our “get it now” culture, but we need to cultivate it. Maybe you’re seeking to persevere through a difficult spot in your marriage or a stormy relationship with a child. Perhaps you’re trying to lose weight. You may be trying to complete a degree, learn to play the guitar, write a book, or grow your blog. You might be on an uphill quest to de-clutter your house. All these pursuits require faithfulness in little things over the long haul, but I get discouraged when I don’t see fruit right away. When I encounter obstacles, I’m tempted to bail out and abandon my goal. How do we keep going? Sometimes we focus so much on accomplishing our dreams, that they drive us. We lose our joy. We take ourselves too seriously. We forget about enjoying the journey. What can I enjoy today? What areas of life can I take joy in while I work to achieve my dream? When we’re pursuing a goal, it’s easy to lose the global picture. Our happiness becomes all about achieving it, and we forget that God is taking us through a process. It’s helpful to step back and seek His perspective. 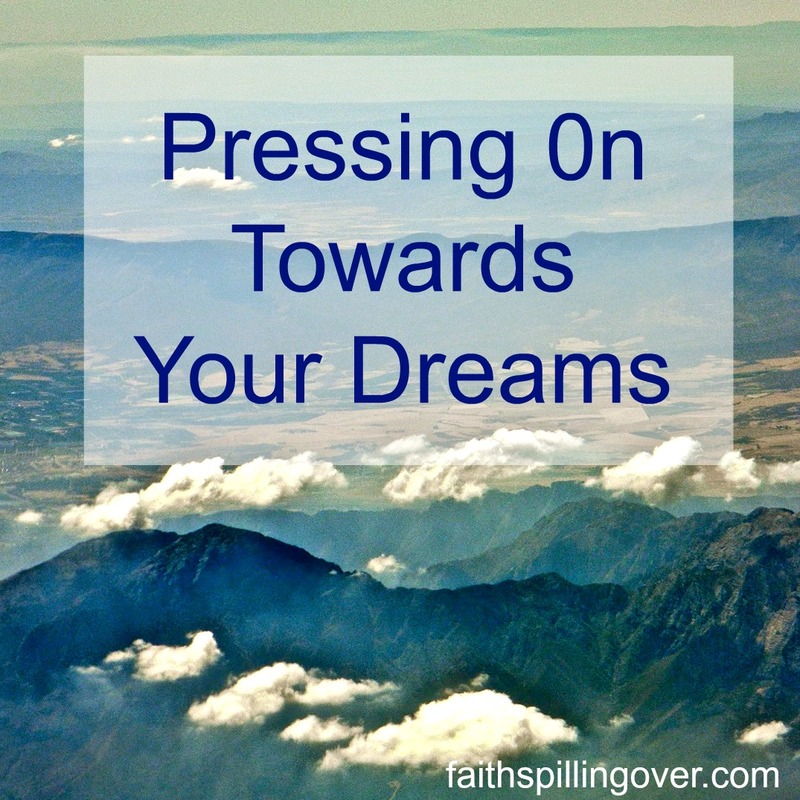 What is God doing in me as I work towards my goal? Persistence is a series of small steps in the same direction. God looks for faithfulness in the little things. What step can I take today toward my goal? If God has given you a goal, don’t give up. Seek Him for grace to enjoy your journey. He’ll renew your perspective and give you the power to press on. Now it’s your turn: Do you have any goals or dreams? Ever feel like giving up? How do you keep going? I link up with these communities: Holly Barrett’s #TestimonyTuesday, Kelly Balarie’s #RaRalinkup, Jennifer Dukes Lee’s #TellHisStory, Holley Gerth’s Coffee for Your Heart, and Grace & Truth. 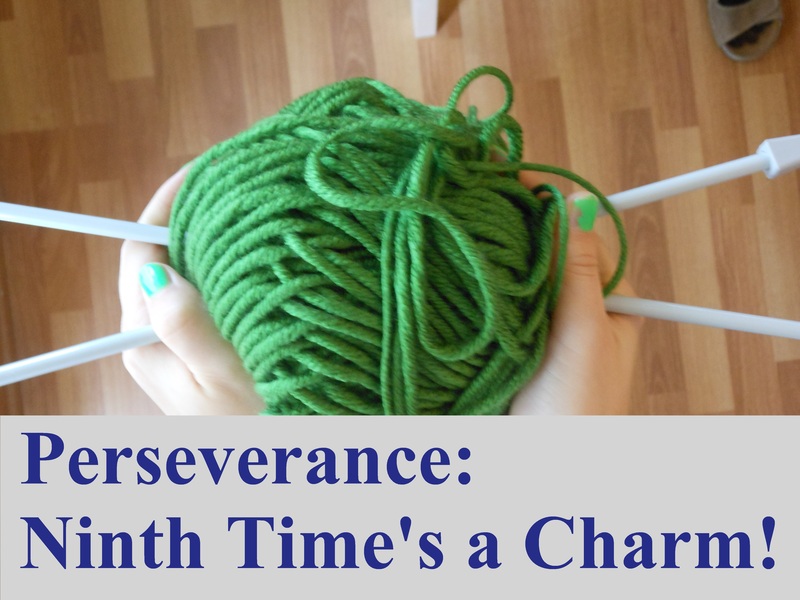 Perseverance: Ninth Time's a Charm! Winter’s almost over, and I still haven’t knitted a scarf, but when I grab a pair of knitting needles, I feel like I have two left hands. Since the time my grandma first taught me, I’ve learned how to knit eight different times. Each time I give up, and when I start again several years later, my two left hands have to learn all over again. So I’m going out today to buy some yarn and get started because this was on my winter bucket list. I’m hoping the ninth time’s going to be the charm. Of course knitting a scarf is not going to make or break me in the scheme of life, but I have other more important goals, like learning to write, helping my husband pastor a small church, and helping my kids grow into responsible adults who discover God’s call on their lives.